It isn’t every day one turns 110. This fall, a ballroom full of guests will come together to celebrate one mother’s milestone birthday, just as they have done for more than a decade. Of course, two is always better than one, and so both mother—Julianna—and daughter—Gene—will celebrate. Since 2003, the birthday party has been a ritual, and so ordering the invitations is by now a piece of birthday cake. 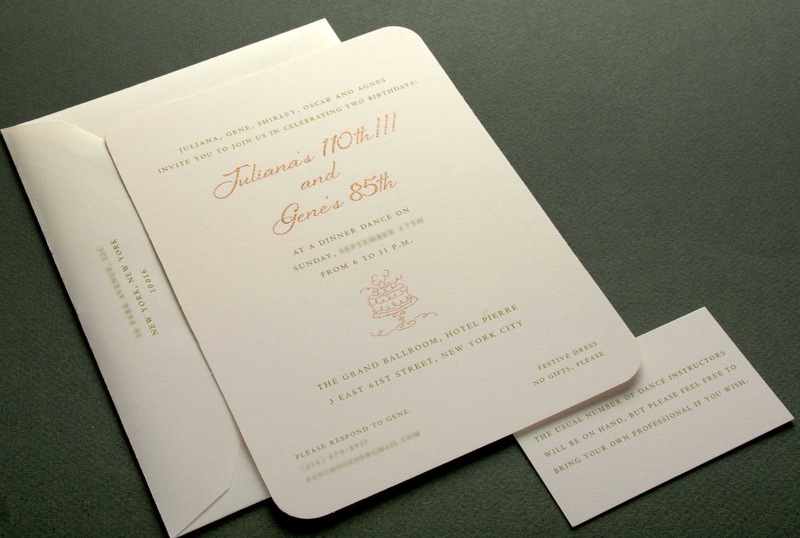 Here, Gene and Simone of Village Invites in New York City talk about keeping the invitation design for an annual event fresh as well as an open mind when it comes to the details. Tell me a little about the background of this party. It seems like it comes from a special place. My mother survived colon cancer in 2003, and so every year since we’ve thrown her a birthday party, usually a dinner dance. She still has a lot of friends—we don’t put last names on the invitations because anyone invited knows who we are. Tell me about the process of choosing the invitation and did you have something in mind going into your appointment? At this point it’s like rolling down a hill, so it takes ten minutes. Each year the invitation is the same, but different—my mother likes gold, but don’t like anything too flashy so something with a modern-ish typeface. What moment are you most looking forward to at the party? When they wheel out the cake. It will be ablaze with candles. I don’t think they can fit 110 candles on a cake! I’m sure they will be standing by with a fire extinguisher [laughs]. Tell me about your first meeting with Gene and a little about the process you went through to get to the final decision. Gene is such a lovely client! She always has a bit of an idea of what she is looking for, but also will gladly take our design suggestions. As we’ve worked together, we look at the invitations she’s done in the past to see what she might like to do differently or keep the same. We always try to incorporate gold as well as a red or green as those are her mom’s favorite colors. Other than that the invitations end up being just as lovely as Gene is. What questions do you always ask at that first meeting with someone who is ordering invitations? We always want to get a sense of the party/event our clients are planning or what they envision. The invitation is the first taste of what’s to come and we want it to excite their guests. So, we typically ask about the venue, the décor, the attire and any theme or personal story. We want to make sure the invitation reflects the individual style of our customers and their event. What advice do you have for customers before they come to their invitation appointment? Before your first appointment, it's helpful to have some images of inspiration to show our experts. This gives us a visual representation of what’s in our clients’ minds. A client’s Pinterest boards or mood boards are extremely helpful in getting this glimpse. We also suggest that the client begin by being open to the general style and not necessarily the specific fonts/colors—those can always change and that’s the fun part of customizing your invitation to your taste! Are you a customer or retailer who has an invitation you love? Email us at concierge@crane.com!